The Olsen Brothers and Cliff Richard will meet in the studio in September to record the song Walk Right Back that was used as opening song for the 2001 Eurovision Song Contest. Just as tradition says the Olsen Brothers, who won the 2000 Eurovision Song Contest, had the pleasure of opening it the year after. After a short reprise of their winning song they sang their new release: Walk Right Back. They will now have to record that song again, but this time together with Cliff Richard who came second and third at the Contest representing the United Kingdom in 1968 and 1973. Since then he has had a big international career, sold more than 250 million records and later on became Sir Richard when the British queen knighted him in 1995. 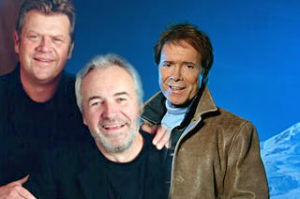 Cliff Richard has been listening to several CD’s by the Olsen Brothers before he decided that he wants to record the song Walk Right Back with them. It is the plan that they will meet in the studio in September and that the CD will be released shortly before Christmas. But fans of the Olsen Brothers do not have to wait that long to hear them as already in April a new album will be released. It is their first album together since 2005 – and for many the new album comes as quite a surprise as it was believed that the duo, who celebrated their 40 years anniversary three years ago, had split up for good after Niels (Noller) moved to Spain and big brother Jørgen participated in the Danish final last year and recorded a solo album. The new CD will once again contain cover versions, just like the two albums “Songs” and “More Songs”. Personally I am looking forward to hearing this song – and to see Olsen Brothers together again. Jørgen might be the best songwriter of those two, but it just isn’t the same without Noller. And Cliff – Welcome back to the Danish charts. You have been missed. The opinion expressed in "In my view" are those of the author and are not necessarily the one of EuroVisionary.com.